To make a snowman cupcake, frost your cake with white buttercream. Use a large round tip, pastry bag, and crusting buttercream frosting to make the base of the snowman. Wait approximately 15 minutes for the bottom snowball to firm, and then make the second. Wait until the second tier of the snowman has crusted and then make the snowman's head. Allow the snowman to fully firm before adding details. A medium-sized tip can create the arms and feet of the snowman, while small tips will make the eyes and nose. A quick whirl of buttercream using a star tip will make the hat. Finally, use a small flat tip to create the scarf and hat rim in your choice of color. Once the snowman has dried for several hours, add a few pearls, sprinkles, or other decorations around the base of the snowman to complete the design. Christmas stockings are just as fun to see on cupcakes as they are hanging around the house. An easy way to make your own stocking toppers is with sturdy cut-paper designs, decorated with glitter and glued to toothpicks or plastic spears. If you want to make edible toppers, pipe out the stocking shapes using white royal icing or cut them with fondant. Let the stockings dry, then draw on decorations with edible ink. Stick the sugary stockings on buttercream-frosted cupcakes. Shredded coconut looks a lot like snow, and it makes a great holiday cupcake topper. To make simple snowy hills, frost your batch of cupcakes with mounds of fluffy white buttercream. Sprinkle sweetened, shredded coconut over each frosted cupcake. You can also use flaked coconut and sprinkle powdered sugar or pearled sugar over the coconut. Incorporating fresh fruit into holiday cupcake decoration is a fun way to show off what's in season. Add some tartness to your cupcakes by topping them with sprigs of redcurrants. If the berries aren't quite ripe or you want a snowy look, douse them in granulated sugar before you set them on the cupcakes. Putting gorgeous Christmas wreaths on your cupcakes isn't as hard as it looks; the only special equipment you need is a leaf frosting tip. Fit a pastry bag with the tip and fill the bag with green buttercream. On a base layer of white frosting, pipe short lines of the green icing at alternating angles in the shape of a circle. When you're finished, use a small round piping tip or a tiny hole cut in a Ziploc bag to add red frosting accents to the cupcake. Don't worry if you're not a fan of frosting. You can still create a seasonal effect by sifting powdered sugar "snow" over plain cupcakes. Just place a fine sieve over the cupcakes, put a small amount of powdered sugar in the sieve, and shake it over the cupcakes until you've achieved the coating you want. For some extra flair, top the powdered sugar with sugar pearls or dragées. If you can't decide between cookies and cupcakes, have both. First, bake or buy a batch of mini gingerbread people. If you like, you can decorate them with royal icing. Then frost your batch of cupcakes with white buttercream, top them with the gingerbread people, and munch away! Embrace winter's chill during the holidays with fun penguin cupcakes. First, frost each cake with a thick layer of white buttercream. Set the frosted cupcakes aside and make your penguins. You'll need a small amount of black fondant, white fondant and optional colored fondant or buttercream to make each penguin. Roll the white fondant out thinly with a rolling pin, and use a sharp knife or fondant cutters to cut small heart-shaped penguin faces and oval-shaped bellies for the birds. For each penguin, roll a small hunk of black fondant into a cylinder shape. Stick on the bellies and faces with a little bit of buttercream, and add small black arms made from fondant or piped buttercream. Add faces and optional hats with edible ink or more buttercream. Poinsettias are the gorgeous, quintessential Christmas flowers, so it's only natural to want to recreate them on cupcakes. With a piping bag and a leaf frosting tip, it's easy. First, frost your cupcakes with a thin base layer of white buttercream. Then fill your piping bag with green buttercream and pipe three leaves at three equidistant points around the edge of each cupcake. Keep the tip parallel to the cupcake, applying plenty of pressure at the beginning and easing up as you get to the end of the leaf. Finally, clean the leaf tip and bag and fill the bag again with red buttercream. To create a swirled effect with the petals, fill the center of your pastry bag with red buttercream and the edges with white frosting. Pipe out poinsettia petals in the same way you did the leaves, starting on the cupcake's outer edges and working inward. Top with small yellow candies or dabs of yellow buttercream. If you're not a fan of fruitcake but want to find a way to capture those holiday flavors in a cupcake, make them into a topper! First, ice your cupcakes with white buttercream, and set them aside. Next, pipe small pools of melted milk or dark chocolate onto wax paper or parchment paper set over a baking sheet. Dip pieces of dried apricot, pineapple, glacé cherries, and other fruits into your chocolate circles. Refrigerate the circles until they're firm, then use them to top your cupcakes. Jingle bells . . . on a cupcake! To make these holiday treats, you'll need buttercream or marzipan in yellow and buttercream in red and green. If you're using marzipan, pat or roll the yellow dough until it's about 1/4" thick. Cut out small bell shapes with a sharp knife, or use cookie cutters. Bake the marzipan cookies, then use them to top cupcakes frosted with white buttercream. If you have yellow frosting instead of marzipan, use a thin round tip and a pastry bag to pipe out bell shapes on each cupcake. Decorate the bells with red and green holly accents using a small round frosting tip. Most craft stores and cake decorating stores carry Christmas-themed wrappers around the holiday season. Look for wrappers that coordinate with how you plan to frost and decorate the top of the cupcake. For example, a Santa suit wrapper is perfect for a cupcake topped with a Santa hat, face, or figure. 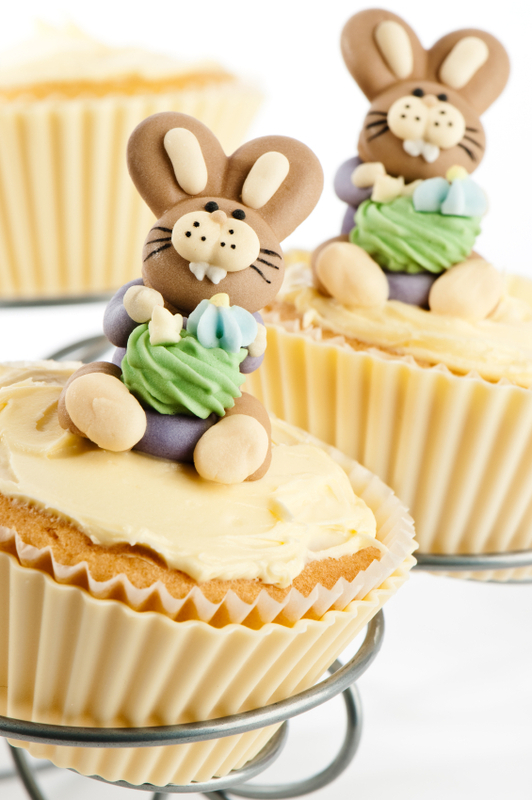 To ensure that the design is visible, add another wrapper after baking and decorating the cupcakes. You can also create your own wrapper. Paste small cut-paper snowflakes onto wrappers or draw them directly onto metallic paper with a glitter pen. Fit the paper into cupcake liners (ink-side down), and bake your cakes right in your homemade wrappers. Sometimes fondant frosting can get to be a little too sweet. In those cases, it's preferable to feature fresh fruit in your decorations. You can make a beautiful wreath of "holly berries" on any cupcake using fresh raspberries and sprigs of mint. First, frost the cupcakes with a thin layer of white buttercream or stiff whipped cream. Arrange several raspberries in a circle on the cupcake, with one raspberry at the center. Then, using small mint leaves, form a wreath around the center berry. To finish, sprinkle powdered sugar over the cupcakes. Of course, sometimes it's tastier (and more shelf-stable) to use the classic fondant. Making holly sprigs is very easy; all you need are small amounts of fondant in green and red. Begin by rolling out the green fondant to a thickness of between 1/8" and 1/4". Using a sharp knife, cut out basic leaf shapes. Make thin scoring lines down the center and up the sides of each "leaf" with the knife or a toothpick. Pluck off tiny pieces of the red fondant and roll them into balls. Finally, arrange two leaves and three red "berries" on top of each frosted cupcake. Reindeer cupcakes are a bit complicated to assemble, but they're one of the most eye-catching decoration choices for Christmas. First, frost all of your cupcakes with a thin layer of buttercream, and set them aside. For each cupcake's antlers, dip two pretzel sticks in melted chocolate. Place the chocolate-covered sticks on a sheet of wax paper or parchment paper, and use a pastry bag and round piping tip to pipe smaller antler "branches" off to the side of each pretzel stick. Set the antlers in the fridge to harden. When they're firm, stick two of them in each cupcake. Place a chocolate wafer in front of the antlers, and pipe a small amount of chocolate buttercream frosting in front of the wafer. Create a reindeer nose using a chocolate candy or chocolate-covered raisin. Make the eyes using white buttercream and mini chocolate chips. Red velvet cupcakes don't require any special decoration to seem Christmas-like; their beautiful red-and-white color scheme has the holiday covered. To make the cakes as vivid as possible, be generous with the amount of red food coloring you use. Frost with stiff, bright white cream cheese frosting, and top with whatever decorations you like, from berries to candy canes to sprinkles. There are few treats more welcome around the holiday season than a cup of steaming mulled cider. To recreate it in cupcake form, you'll need fresh apples, citrus zest, raisins, and cinnamon sticks. First, frost all of your cupcakes with a base layer of white buttercream. Next, use a mandolin or a sharp knife to cut multiple thin slices into apple wedges, so you can fan each wedge out slightly. Top the center of each cupcake with an apple fan. Place a couple of raisins and a cinnamon stick around the fan. Finally, sprinkle the cupcake with citrus zest and powdered sugar. Brrrr! For frosty, snowy-themed cupcakes, you'll need blue wrappers, a batch of stiff white buttercream, blue sprinkles, and silver dragees or edible silver glitter. Bake your cupcakes in the blue wrappers. After they've cooled, pipe a generous amount of white buttercream on top of each one, forming a mountain shape. Place a few blue sprinkles on each cupcake, then generously top the cupcakes with silver dragees or silver glitter. To get an even glittery coating, put the glitter into a sieve and then shake the sieve over the cupcakes. It's easier to involve kids and family members in decorating Christmas cupcakes when the work isn't complex. For a simple but showstopping effect, use magnificent toppers. You can buy snowflake toppers at cake decorating stores around Christmastime, but you can also make your own by attaching cut-paper snowflakes to toothpicks or plastic wands. Mini ornaments and Christmas trees also make great holiday toppers. Decorating Christmas cupcakes is a festive holiday activity, so start planning your holiday design today!